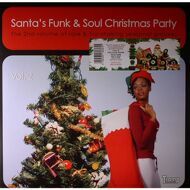 Santa's Funk & Soul Christmas Party Vol. 2 is simply intergalactic! There is no better instruction manual for decorating the Christmas tree (Little Jimmy Thomas - Deck the Halls). It is a most righteous accompaniment to seeing the first snowflakes dancing through the air (Tina Roberts - Snow). Galactic garden gnomes will surely have a fling to Pearl Bailey's Jingle Bells Cha Cha Cha, and all Martians will be snapping their fingers to Gee Whiz, it's Christmas. At his 874th anniversary this December, Paul's grandad will get up and boogie to Martin Mull's Santafly just like Christopher Walken did in Weapon of Choice. Fortunately, Paul realised how crackbrained it is to celebrate Christmas without his beloved (Jimmy Jones & his Versatiles - Christmas is a drag without you baby), so he split to be back home in time and left me to pass on this farewell: Merry Christmas everybody!